When I wrote the post Medical Records, I was waiting on a third batch of records to arrive. I’ve had that batch for quite some time, but never managed to write about what I learned from reading it. On my first read-through, I laughed hysterically. For example, at the line “Smiled inappropriately several times during the interview when talking about suicide and substance abuse.” Gee, you think maybe because I was nervous?! I’ve been seeing my current therapist since May and she’s still waiting for the day when I’m comfortable enough to hold a conversation without being sarcastic and cracking jokes. There’s also a note of “laughed when asked to sign a safety contract”. By this point, I’ve lost track of how many I actually signed, and how many times I laughed and said signing was pointless. Initially this was because the contract relies upon a willingness to pick up a phone and call for help if having suicidal or self-injurious thoughts. I knew I would never, ever pick up the phone. Eventually I did call once, on a lunch break from work, to discuss the fact that I had a strong urge to cut myself. Did that 5-minute call help? Actually, yes. Am I at all confident in my ability to call again? No, especially considering my failure to call somewhere between nagging suicidal thoughts and the overdose that occurred days later. Another example of the hilarity was a 3-page Emergency Services Assessment that managed to note not once, not twice, but thrice that I had walked in with a number of suicide methods written on my arm. This was actually more of an intellectual exercise (or, as the inpatient psych APRN noted, “an academic thought”) than anything else, but the on-call therapist (who I wanted to talk to about feeling stuck with my current therapist) fixated a bit on the content of my “self-decoration”. I’m also a bit enamored of the phrase “Risk for not taking medications as prescribed.” I’ve never quite been sure if that is a risk they consider specific to me, or simply a product of statistics about my diagnosis. At the time this particular report was written, I had a couple of instances of taking leftover pills that were no longer prescribed, but had not yet experienced the 5-day stretch of willfully skipping my medication. So perhaps they were leaning more toward statistics at this point, although my own stupid behavior would account for this risk assessment in the future. The most informative portion of these records was an update to my Adult Needs and Strengths Assessment (ANSA). This assessment has to be updated every 6 months, so this was my second time having it done. I was curious as to how it turned out, because I was not actually involved with the production of this assessment. My therapist did it herself based on information from past sessions, because on the date it was due she was too busy dragging me back to the inpatient unit. My reaction to this assessment was a sudden increase in depression. Each need on the assessment can be ranked 0 = no problems, 1 = history/mild, 2 = moderate, or 3 = severe. At the time of my original assessment, there were 5 needs ranked at level 2, and everything else was 0 or 1. I went into this assessment expecting about the same. I thought there might be a couple more at level 2, simply because my original assessment was based on 90 minutes with a stranger. I noted on one of my diary cards that I felt sadness because “ANSA update was depressing.” In therapy I continued that by saying “All those needs exploded everywhere.” Before my therapist could even try to reassure me, I commented that I knew it was a matter of them being needs this whole time, just that they hadn’t been recognized yet at the time of the original assessment. Does this make me feel any better? Not so much. It doesn’t change the harsh reality that there is so much to deal with in therapy that I will probably never go more than a week without it. In all these years, it’s never even occurred to me to request any of records from anywhere. I don’t see the utility in it for me personally. I’m impressed that you’ve dealt with it as well as you have. Do you plan to keep requesting things moving forward? 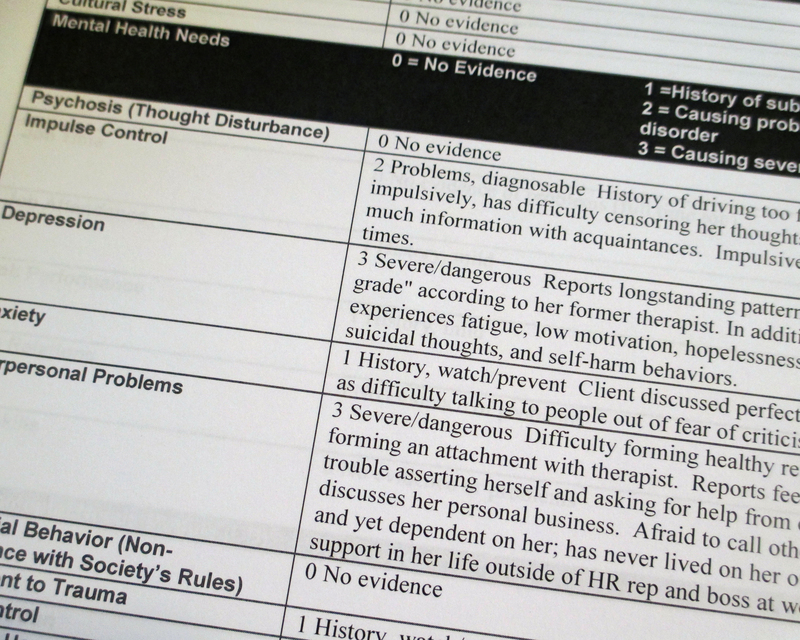 Would it maybe make sense to have your therapist go through your records to get the specific answers you’re looking for, and in doing so relieve you of the burden of having the records yourself or having to go through them in full? For the most part, the things I find interesting aren’t things I’d know to ask for. I did mention with this last batch that I had not received any of the shift notes from my inpatient stays, and my therapist read off the comment portion of them to me, but it was not nearly the same as getting to see it for myself. I don’t find it a burden to read them. I’m going to hold out until Valentine’s Day, the 1-year anniversary of the start of this adventure, and request the updates up to that point. I’m thinking about possibly writing a book about this first year of treatment.